While we are hard at work on Innkeeper and HL, our agent emailed and asked us if we knew anything about this puzzling communication she received. Things are getting deadly serious. Click to enlarge. I shudder to think what might happen next. Shades of Wicked is by Jeaniene Frost by the way. How that can be confused with Illona Andrews is a mystery. 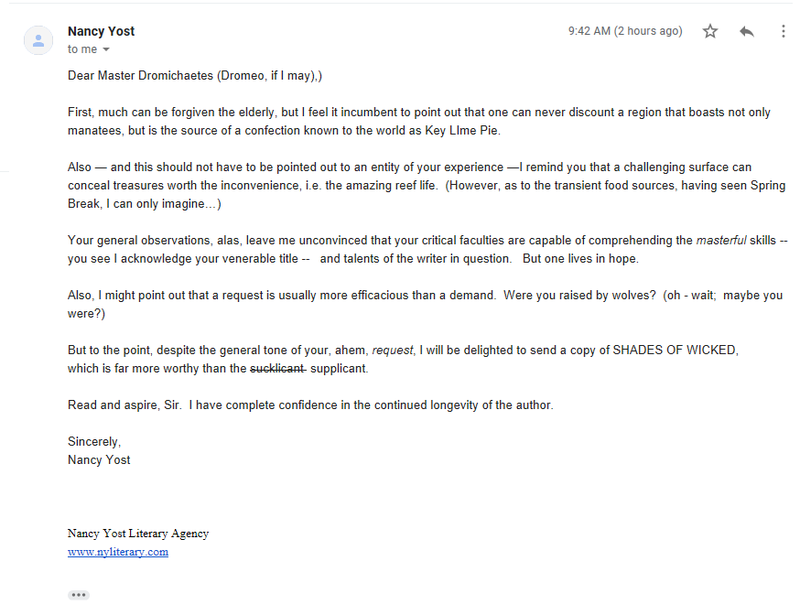 I can’t quite figure out if this is someone with a seriously bent sense of humor trying to get a free copy (it’s not officially published yet) or more worryingly actually believes they’re a 300 year old vampire. I’m leaning, hopefully, towards the former. Oh, and the ALs obviously chose well in having Ms Yost as their agent. She’s hilarious! It is a joke, they are friends. See Jeaniene’s response here. These “letters” are too funny. Thanks for the link! Possibly because Jeaniene and Ilona are BFFs. Seriously bent? It’s light humor and meant to be fun. I don’t see it how you could think that it’s real or that the person genuinely thinks that they are a 300 year old vampire. It’s fun, meant to entertain the authors and us, and it does the trick. Nancy Yost’s response is great. It is really funny. I am enjoying the back and forth. It is a nice break from reading contracts on the offer I am making for a new house. LMAO This is hilarious. So much fun to read little bits and peices such as these. Thank you for the enjoyable interlude on a grey, wet day. All I have to say is thanks for the laugh. The Andrews have a sick sense of humor. I appreciate that. Brilliant as always. Nancy is an unexpected treat – sucklicant, indeed. You know you’re in for a treat when you haven’t even gotten past the email address before you’re laughing out loud. I can’t help but think that Fangmaster4unlife would be a great gamertag, especially if the person stayed in character for all in game chat. Also loving Nancy. Thanks for the giggles on a day I really needed them. Lol do you mean like that stonemountain64 commander guy ? Omfg that would be fangtastic! Hilarious!! Love this. I don’t know how you thought of this but it is awesome!!! 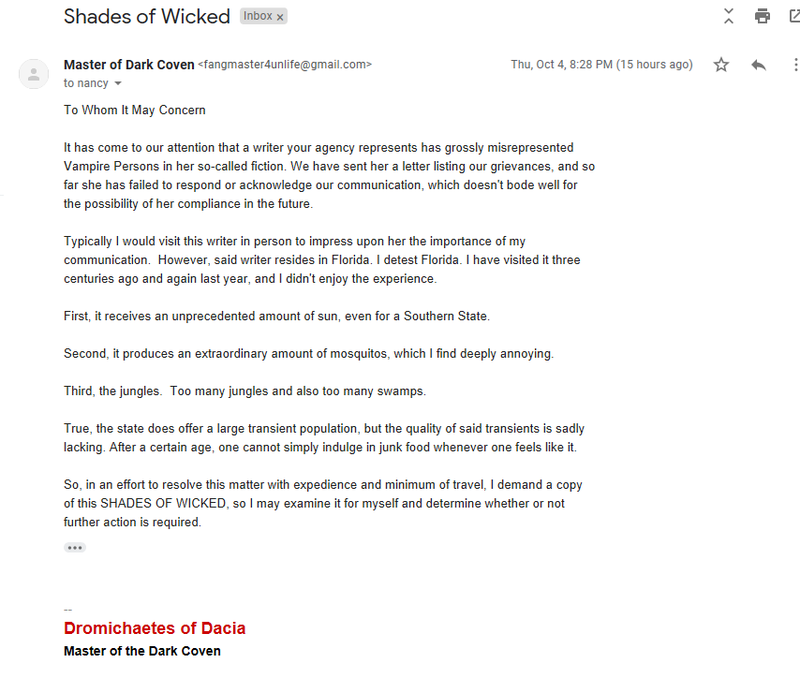 Can’t wait to see what the Master if the Dark Coven thinks of Wicked Nights. I personally can’t wait to read it. This exchange reminds me of the columns one of the Chicago newspaper Op-Ed writers used to address occasionally to various denizens of the Lower Depths, generally involving hijinks of a political nature. Great reading and good laughs! So much fun, especially after a very long week. Thank you! Will it work with Nancy if I write her too? It worked and the advance copy is coming! I was going to applaud having an agent with a sense of humor, but decided that is probably a prerequisite for a successful agent. Thank you for sharing. I couldn’t stop laughing and it just made my day. Nancy Yost has a wonderful sense of humor and it was a fun read. Ditto! Also preordered the book! You’re so funny ! This is art. “You” plural, i.e., kudos to Ms. Yost, too! Nancy and Ilona: you are wicked, wicked women. Do not change a thing!! Snorted my coffee when I read this. Cleared sinuses right out. Hugs guys.